I can remember when I was 15 years old and I slow danced with Alexis Lankford. She was a tall, pretty blonde girl with a dazzling smile. I learned later from a friend that she had a huge crush for me, but I didn’t know at the time. I have a distinct memory of holding her very close with my eyes closed. I still remember her perfume. The most striking memory these years later is the warmth that came from her fully developed breasts pressed tight to my teenage chest, a very new experience for me. They seemed to have an infrared set of coils rotating around each one. Their warmth left a 40 year impression. During the dance she would give off involuntary shivers that also remain in my memory. She told a girlfriend, who later told me, that she was trembling from fear of being that close to her crush. Wish I had known that, I just thought she was vibrating for reasons unknown to a 15 year old. I thought all girls must do that. There are times when we slow dance in life and everything seems to leave a lingering memory; a memory that could be so easily overlooked in the whir of each days fast dancing. 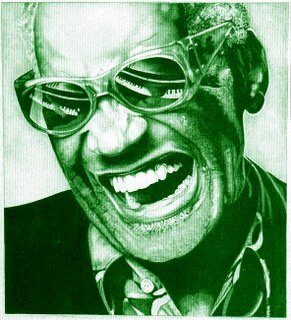 I first started thinking about slow dancing again while watching the movie Ray, a movie/biography of the late and great Ray Charles. Ray began going blind as a child. Naturally he had to learn to do things in his world in a new way. One of the sensory adaptations that come in the blind is the sharpening of the hearing sense. This happened in Ray’s world. In one scene of the movie he describes to his future wife how he can hear a hummingbird outside an open window some distance away. To odd behavior I confess. I began to close my eyes over the next few days in random circumstances. I tried to keep them closed and still function. It will not surprise you how difficult this can be. I found I would sometimes open my eyes involuntarily; the need to see was so profound in my sensing vocabulary. I tried showering and shaving blind. I tried to find leftovers in the refrigerator by touch and smell. At the orthodontist office I tried to figure who and how many people were in the office by isolating sounds and voices with my eyes shut. To odd behavior I confess. I also confess to having earned a new understanding. We aren’t slow dancing enough in our lives. By removing one sense, I discovered there is still a wealth of sensory clue remaining. This also taught me that there is a big bundle of sensory input that is extraneous. In the ortho office I had trouble distinguishing individual voices because of the irritating pop music that came from overhead speakers. In the shower I had trouble finding my razor because of the store of commercial bathing products aligned on the shelves. There is a lot in our world that we bring into our environment because we may feel bored and disinterested with what is already present. I have been gone from our blogland a little while. I’ve been slow dancing and being blind, and learning new ways to see. I discovered my belly button feels different in the shower when I’m blind. Food tastes better or worse, depending. Music is sharper, traffic horns are louder. So, whatever it may be worth to you, I suggest that once in a while you remove some sensory overload. Sit on the equivalent of a rock in the wilderness listening to silence. Discover what you have missed by removing a sense you depend on. What other things can we see if we are truly deaf? What can we hear when we become blind? Are the extras meaningful? I think they may be. I am slow dancing in Texas, listening to the quiet and stumping my toes on the couch. Seven, how interesting. This brings to responses from me which I will *try* to keep brief. A few days ago I was talking with a high school boyfriend (he was 16, I, 15) about when we slow danced, eyes closed, of course, and how we became aware of many things during those moments. Yeah, *that* was mentioned, but we also both remembered various others: the sounds of the other dancers, laughter, sometimes some heavy breathing, the music itself, etc. I love that so many other senses heighten when one is compromised, but sight is probably the most remarkable. Wen working with parents of children with ADHD (Attention Deficit/Hyperactive Disorder) I did an exercise to help them understand why their child was so driven in the irritating behaviors. Be quiet. Don't say anything at all for 30-60 seconds. That's all. Did you notice all the sounds around you that you didn't otherwise note? Things like traffic outside, birds, the air conditioning/heating running, the refrigerator humming, people coughing or sighing or talking down the hall, a radio in another room, etc. Children with ADHD don't have the ability to "filter out" the unnecessary sounds, those background noises, and they are inundated with stimuli that they can't process and know which to use. We are fortunate that most of us can do this. So when sight is "lost" or something causes a change of input, we can learn so much about our world. I encourage everyone to close their eyes, quit filling the air with noise, experience what is around. It is a beautiful world with details that many have forgotten! I'm going to be quiet now. This is a wonderful post Seven. I have often pondered the question would I rather go deaf or blind and i've come to the conclusion i'd rather go deaf. To miss all of the sights and visual beauty of our world is unbearable to me. On the other hand to read about how Ray compensated for his loss of sight by sharpening his hearing is a wonderful lesson in adaptability. To hear a hummingbird.... incredible. Bob Dylan, 1962. Slow dancing died a decade later. I LOVE that song. Which is good since it'll be stuck in my head for a while. I agree with you. I recently took a class for work and the instructor started out by telling us how many bits of information we are given (or forced to take) a day. It was in the millions. It's increased exponentially over the past decades. Any day now we'll all just short circuit. I slow dance with my daughter every night...I know it's not exactly what you're sayin' here...but it's good. i often close my eyes to remember something better... to imprint it on all the senses. It's an amazing feeling. What an interesting post Seven. I will have to read it again and contemplate it more, but I really enjoyed it and the message. I thank you for it. "Now you can do this..."
"CORA- STOP! Be still- focus- listen." I heard the rush of warm air being forced through the vents. I realized my hands were cold. I heard myself breathing- felt the rise and fall of each breath. I squeezed my hands together- trying to warm them...only to find that my pinkie's were warm, but my pointer fingers were like ice. A teeny tiny nerve in my lower back twinged a little. I wondered how often it does that? And how I don't pay any attention to it. I thought of Ray Charles, then you again (stop, stop, stop! )...then I thought of Helen Keller. That was a sober moment. No sight, no sound. A mind trapped in an otherwise healthy body- but what a rich life she had. She understood so much! I KNEW you would know that! Yep,me too and now Rick has given us its origins. I especially like Bonnie Raitt's version. Years ago when Toffler wrote Future Shock I think few knew how right he would be about the info overload! And....I hear you got to meet the Fish from London. I do dat 2! Sometimes I close them during an event I WANT to remember. I know as an artist it must be impossible for u to imagine going without sight. Can u even imagine? You are a flirt....and I LIKE that about you. I should also mention of course that you are a terrific writer and my regular friends here would be wise to surf over to your place.. I enjoy the way you oscillate between deep thoughtful posts- and the ones full of humor- usually laughing at your self. I'm not sure I'd appreciate the humorous posts as much though, if not for some of the things you've revealed at Enemy's site. How did you know this flirting thing??? Do u have spies in Texas? Enemy can bring out a lot of thought, that's for sure and she has a talent for causing people to examine darkness in our world. That's certainly not a criticism I enjoy her site and her thinking a lot and I know she knows that. Still, I smile because I WILL prevail. Indeed- we shall if we think so! excelent post as always Seven. I have written a few posts with my eyes totally closed. I tend to see the words better this way. All the out side destractions gone... Nothing but me and the words... and my emotions. I would rather be blind then deaf. I couldn't bear to lose music. Yes I remember you writing once that you type with eyes closed. It seems to me you know this thing I talk about on an intuitive level. Not me of course, I need to close my eyes and stick my hand into the spaghetti before I understand it!